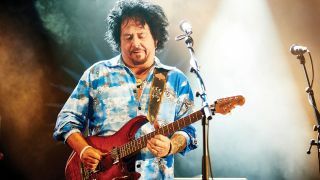 Although he’s not a traditional blues player, Steve Lukather does bring a blues sensibility into most things he plays - and he plays a lot of different styles. Players such as Joe Walsh, Jimmy Page and David Gilmour were major influences on him as a young man, as were the jazzier session men like Larry Carlton and Jay Graydon from the Steely Dan stable. But let’s pull things back towards the blues here! Steve’s knowledge of scales and harmony gives him the ability to view classic pentatonic patterns in an informed context, enabling him to play jazzy ‘outside’ lines from within a blues-type format. Skills such as this are the result of both theoretical study and real-world experience. Having played around 1,500 sessions for the likes of Michael Jackson, Lionel Richie and Earth, Wind & Fire, plus his own band Toto and various solo projects, Steve has developed from the 20-year-old prodigy who played on Hold The Line to a sort of elder statesman who has come through the era of cranked Marshalls, to towering effects racks and back to a relatively simple setup with just a few pedals. To get the sound for this solo, I plugged in a Keeley-modded Boss Super Overdrive to boost an already distorted Vox AC15. Delay/ reverb effects were added in the mix, but Steve uses these in the effects loop of his amps live. His distinctive vibrato and bends are partly facilitated by his use of light strings, which goes against a lot of the sage ‘heavy strings/high action’ advice passed around in guitar circles… This solo isn’t a detailed study of Steve’s playing (you’d need a lot more than 12 bars to do that! ), but hopefully shows some of the process that goes into making his memorable solos. Taking a very major pentatonic/melodic approach, this opening phrase wastes no time in getting to a device that will probably forever be associated with Steve due to his solo in Rosanna. Taking an already bent note, I’m adding my fourth finger on a fret above to get a semitone higher for just a moment. Getting your fourth finger to comply can be a test of patience at first, but is well worth it! Taking a similar approach to Example 1, you can hear that I’m digging in pretty hard on those lower strings. This can help give definition, especially when using the neck pickup with drive like this. In fact, the drive setting here is crucial - you need enough to give the sustain, but avoiding the fizz and mush that results with higher settings, especially at volume. Tones like this live in the midrange, so try adding a little more than you might usually, especially for solos. Though most of these examples can be traced back to pentatonic origins, this idea has more in common with the D major arpeggio. Some strategically placed slides enable a shift of position that frees us from the usual ‘box’ constraints, with a melodic line formed mostly from triplets, which fit over the shuffle backbeat. Note the skipped string when jumping the octave in the final bar, something Steve is very comfy with. Before we get into more triplets, check out the slides and arpeggio-style melodic device (hint: this could also be viewed as a shape 3 A major pentatonic). Steve seems to enjoy using swooping bends and slides to give his playing a flamboyant character, much like the man himself. Though these ideas may take a little while to assimilate, it’s worth persevering, as the potential melodic invention is greatly increased.